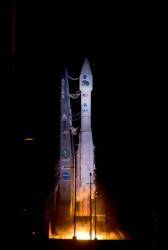 NASA launched its Radiation Belt Storm Probes (RBSP) yesterday (August 30, 2012), with a scientific mission to explore the planet’s radiation belts, where solar storms can amplify space weather effects, posing dangers to GPS satellites, communications, and human spaceflight. "Scientists will learn in unprecedented detail how the radiation belts are populated with charged particles, what causes them to change and how these processes affect the upper reaches of the atmosphere around Earth," says John Grunsfeld, associate administrator for NASA’s Science Mission Directorate at Headquarters in Washington. "The information collected from these probes will benefit the public by allowing us to better protect our satellites and understand how space weather affects communications and technology on Earth." addition to a subject of concern to GNSS users worldwide. inclination of 10 degrees from the equator. space, and by such solar events as coronal mass ejections (CMEs). web seminar on the subject of space weather later this year. monitored by registered users. More information ont RBSP’s space weather data program can be found at the RBSP Science Gateway. and Proton Spectrometer Belt Research Relativistic Proton Spectrometer. Flight Center (GSFC), in Greenbelt, Maryland. 54 yards long, to begin gathering data.